Sparky and I have been tracking bridge building and unbuilding for the past 3 years. 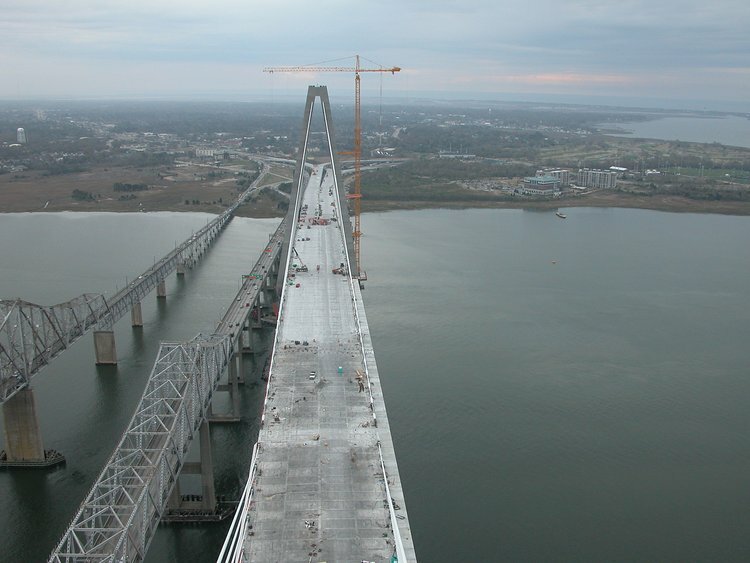 The top of the Ravenel towers provides an unusual view of both the building and unbuilding processes. 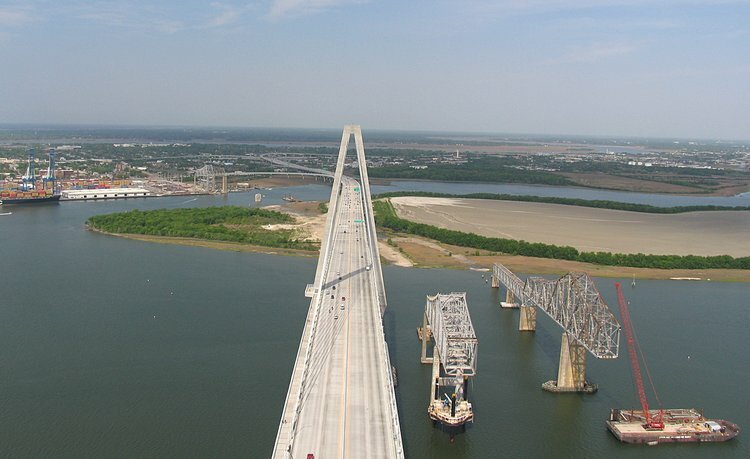 When Sparky sent me his photos from yesterday I thought it would be interesting to use the photos taken from the top during the Ravenel building - over the past couple of years and focus not on the building but the views of the Town Creek, Drum Island and Cooper River segments of the Grace and Pearman Bridges. Here are the comparision photos. 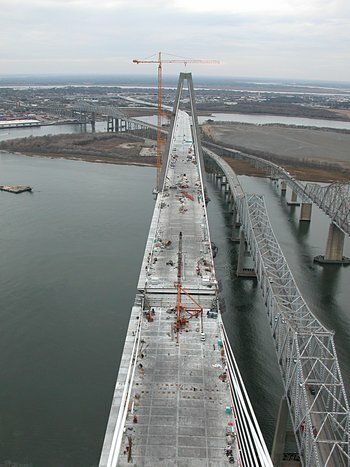 Feb 1, 2005: From the east Ravenel tower, there is a clearer view of the Pearman and Grace cantilever sections. Note the square box surrounding the Grace support just before the cantilever section. 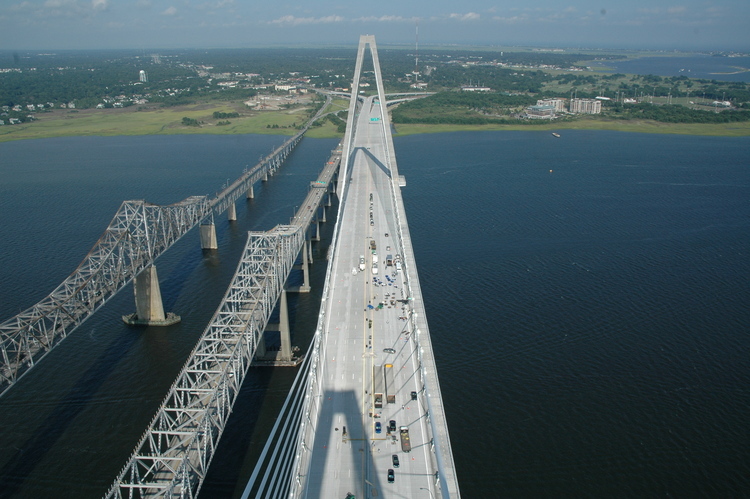 This is the region that had to be rebuilt during the Pearman construcdtion. Today, Oliver Forget and his Freyssinet team pulled the last pair of stay cable. 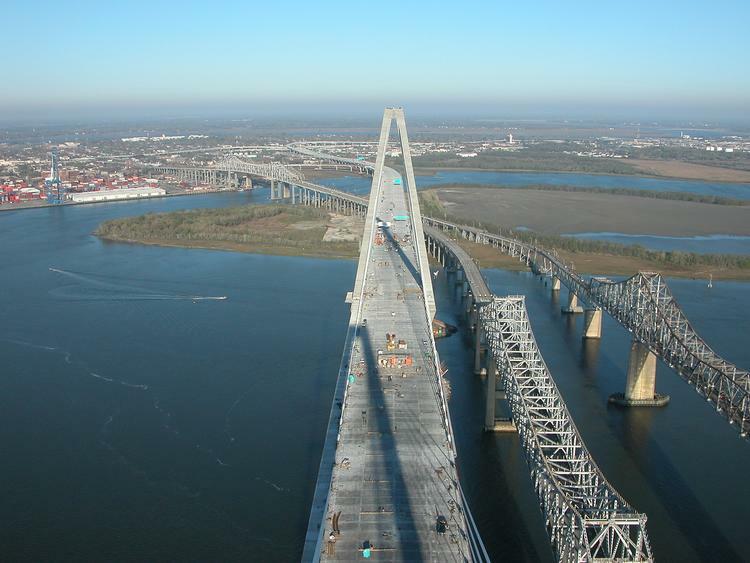 Being February, the air was clear and the top of the east tower provided a good view of the main span gap on the Ravenel as well as the Pearman and Grace cantilever sections as well as their feeder Drum Island sections. 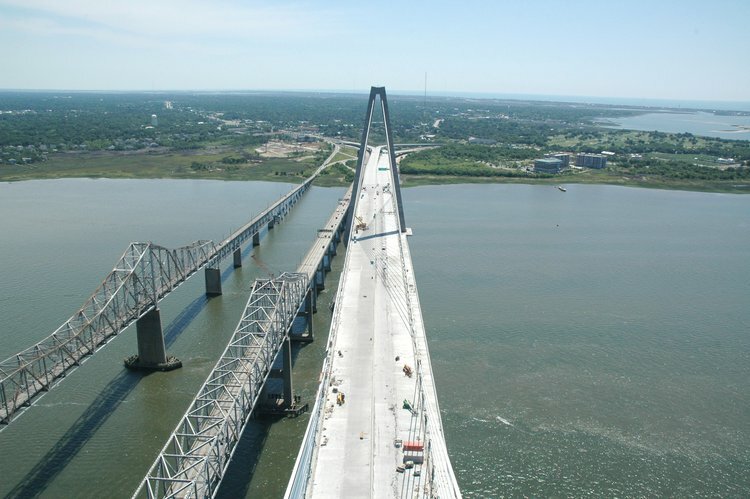 Shortly after the east and west main spans of the Ravenel were joined as seen from the east tower. 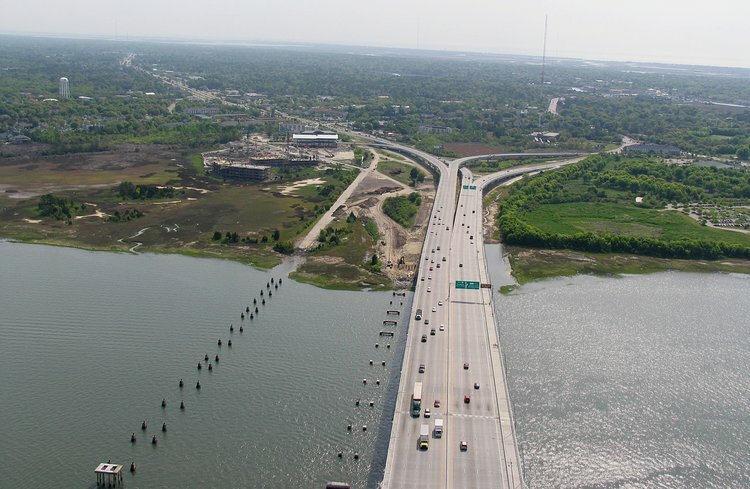 Another good view of the Grace and Pearman structures crossing Town Creek and Drum Island. And Sparky's view of the unbuilding from the east tower. Gone are the Town Creek spans and the Drum Island structures. 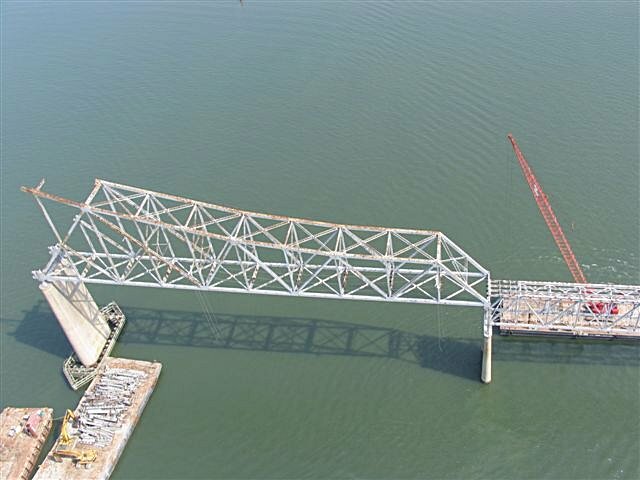 All that remains are paths across Drum island and the west Pearman cantilever and the Grace cantilever and approach sections. 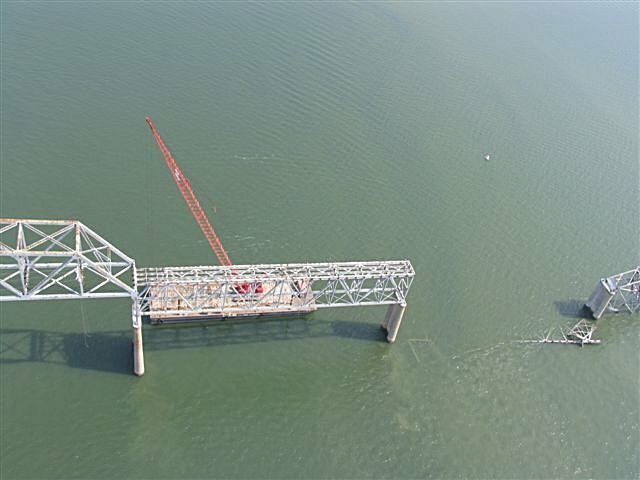 Mickey's Advanced Blasting Service has removed the D-25 to D-28 Pearman substructures and the jackup barge is resting in front of C-2 supporting drilling for implosion. The only remaining structure in Town Creek is P-3, Michale's pain-in-the-neck. 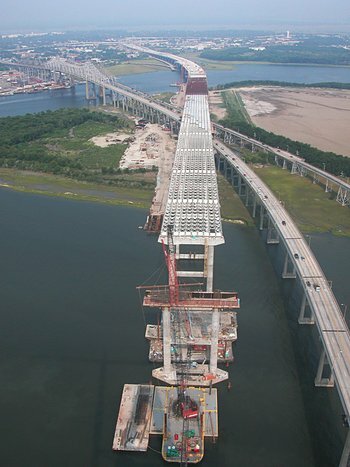 The east tower crane is still in position. 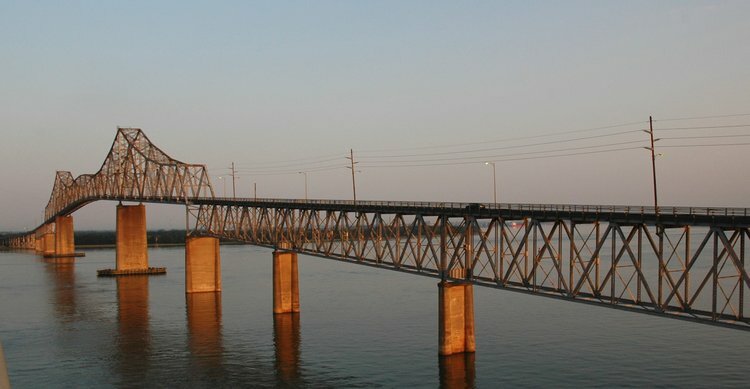 The light gray section near the bottom of the photo, where the stay cable change direction, is where the east and west spans were joined. 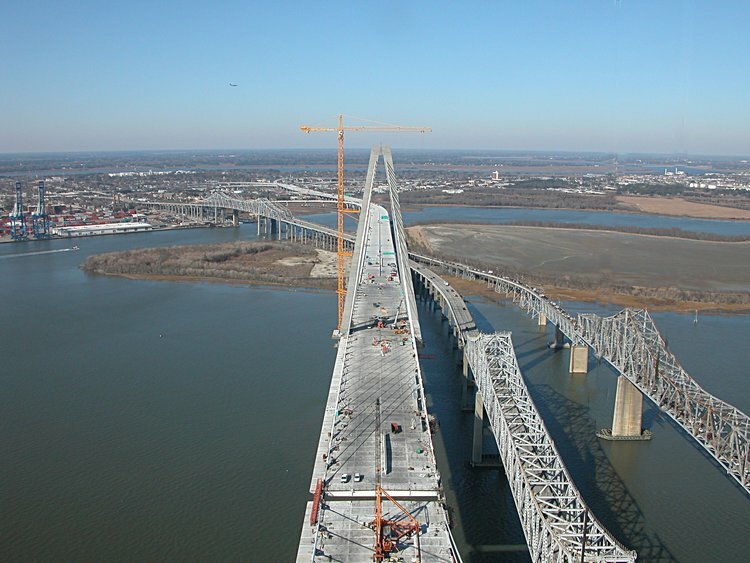 The day before the opening as seen from the west tower. The white and yellow lane markers are in place. A clear view of the Mt. Pleasant approaches and the future home of the Mt. Pleasant observation and fishing pier. April 14, 2006: Sparky's view. Note the residual Pearman substructures that will become the supporting structure of the Mt. Pleasant observation and fishing pier. Julian Adams in Joanna, SC has super curious eyes and has noticed that near the expansion joints there are dark streaks in the middle of each lane on the east side of the westbound lanes and on the west side of the east bound lanes. My guess is this is oil from diesel engines that shakes loose after the small bounce associated with passing over the expansion joint. There must be a better solution to this question. Any other ideas?